The rumor that Will Smith will play Ultraman in an American version of the Japanese series is highly speculative, but not out of the question. The case for Will Smith playing the role as Ultraman would be stronger if there was a second source that could confirm it. Currently, every website that is posting this information is referencing a single source; NukeTheFridge.com. including Nuke The Fridge them self. There is no second source for this rumor. "A source inside Sompote’s entourage indicated that the action/sci-fi feature film would be done in the style of Guillermo del Toro’s international monsters vs. giant robots’ hit “Pacific Rim.” Word has it that “I Am Legend” alum Will Smith is being sought for the role..."
The Sompote being referenced in the blurb above is Sompote Saengduenchai, a Thai director who was embroiled with a licensing dispute with Tsuburaya Productions. Sompote claimed the rights to Ultraman were given to him by Noboru Tsuburaya, the son of Ultraman's creator, Eiji Tsuburaya. 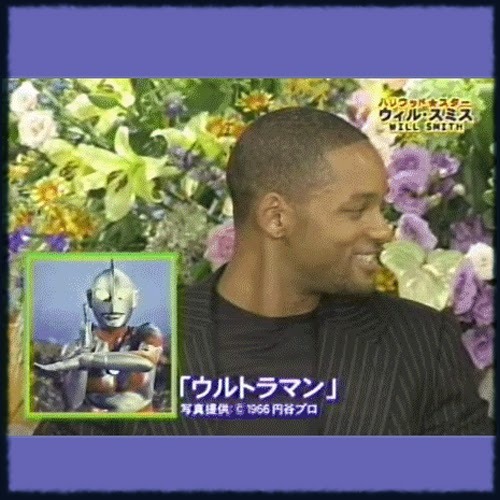 What we do know is Will Smith is on record, more than once, declaring his love for Ultraman. Once in June 6th 2008, while promoting his super-hero movie Hancock, he mentioned Ultraman on The Tomight Show with Jay Leno. Again in Japan, as you can see in the video below he professes his child-hood love of Ultraman. He even gives a pose at the end of the interview. Watch it below.